Picture walking into your kitchen in the middle of the night. You flip on the light switch and under your feet you see a living rug made of cockroaches. Hundreds of them scatter as they attempt to hide from you. As you were too fixated on the horror you almost stepped on, you missed the others on your counter top eating your food. The next day when you grab an apple and take a bite into it, you also get a mouthful of the nasty bacteria left behind by the roaches. Look for an solution and you’ll find countless products and bits of information with various claims. The most important info you should know are the truths of what attracts cockroaches. Knowing these facts allows you to get the best results and may even save you hundreds of dollars from products and maybe even professional exterminators who are less than honest. Because even if the product or service kills them for them moment, they will most likely return if you don’t take care of the cause of the problem–what is getting their attention and inviting them to come in. Will they really tell you how to stop buying/paying for their product/service? All it takes is a single roach sneaking into your home–lured by what you unknowingly offered. Once it gets in, it’ll invite it’s friends over and they’ll reproduce and multiply at an insane rate. What draws their attention in the first place? Food does–the strong smell coming from food. Food means the food you eat and the food you toss out. They don’t mind if it’s dirty, or that you’ve tossed it in the trash. What can you do then? First, always put away your food when you’re done eating. Don’t leave any leftovers sitting on the counter for a long period of time. Cover it up and put it in the fridge if that’s where it belongs. Food going bad will develop a strong odor and that odor will really get their attention. Second, take care of your trash. Always keep your trash can covered. It is critical to take out the trash before it starts to smell. You must keep it clean. If you drop bits and pieces of food, pick it up and throw it in the trash. Clean your counters and sweep your floors at night. Besides food, roaches will also seek water and thus are attracted to moist places. All they need is a few drops now and then. That means leaky pipes in your home provide the perfect source of water for them. Again, they don’t care if the water is clean or dirty. Drinking water leaking from a drain pipe is disgusting to you, but it’s as good as bottled water to a roach. Common places to check for leaks are under the kitchen sink and under the bathroom sinks. Fix any leaks you that you find. Check them on a regular basis to make sure there’s no easy source of water for them. If you have pets, empty out the water bowls (food as well) at night. The last thing a roach will look for is a suitable shelter. It will shelter itself anywhere in your house where it can safely hide from you. This does leave a lot of area you can’t easily reach, but there’s a few things you can do to make it harder for them. One thing you can do is to keep your house neat and clean. The less clutter there is, the less places they will have to hide. This especially applies to your kitchen and the cabinets. Many of them will stay close to where the food is, so a cluttered cabinet full of boxes, etc. will provide lots of places for them to hide in. In summary, cockroaches are attracted to three simple things, food, water, and shelter. They’re first drawn in by the smell of food. Then if they find a water source and a suitable place to settle in, they’ll bring in more of them and multiply to the point where they practically own your home. 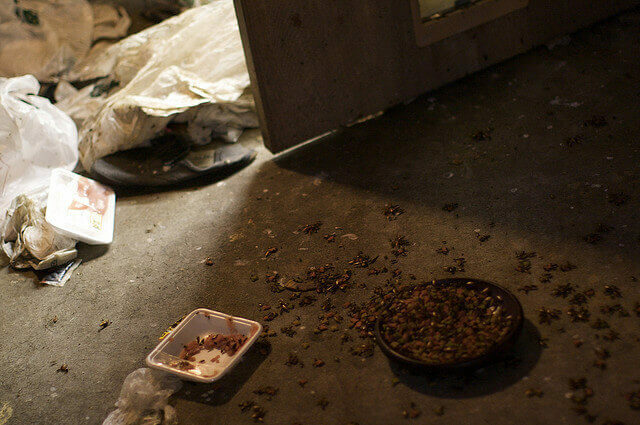 Now that you know what attracts cockroaches and lures them in, you need to take action to prevent them from even considering about entering your home at all. Once you’ve taken necessary action to prevent attracting any more roaches, find out what kills roaches and move on to getting rid of them.